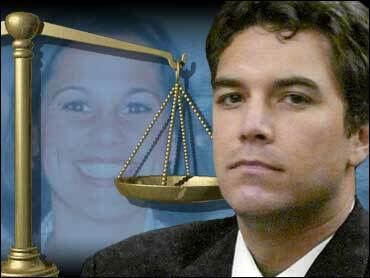 Scott Peterson wept, his chin to his neck, dabbing his eyes with tissues, while jurors at his murder trial looked at autopsy photos of the fetus his wife had been carrying before her death. Images of the fetus were displayed Thursday on a large white-wall screen on the same day that a forensic pathologist testified the fetus was expelled from Laci's Peterson's decaying body after her death. Dr. Brian Peterson, who performed autopsies on Laci and the couple's fetus said there was no evidence Laci had given birth before her death. Her uterus had not returned to normal size as is typical after a woman gives birth, said Dr. Peterson, who is not related to the defendant or his late wife. "That means Ms. Peterson was pregnant and the baby had not been delivered when she died?" prosecutor Dave Harris asked. "That is my opinion," Dr. Peterson replied. Dr. Peterson said no cause of death could be determined for Laci or the couple's fetus, a boy they planned to name Conner. At times, the pathologist's testimony seemed contradictory. "It was her death that caused Conner's death while he was still in the uterus," Dr. Peterson said under questioning from prosecutors. However, on cross-examination, Dr. Peterson acknowledged he could not determine whether the fetus had been born alive. He estimated its age as nine months. Prosecutors claim the fetus was expelled from Laci's decaying corpse, while defense attorneys say the baby was born alive and murdered later, which they say proves their client could not be the killer. Laci Peterson's autopsy photographs were displayed to jurors Wednesday, while photos of her fetus were shown Thursday. Her family has not been in court all week. Scott Peterson's mother, Jackie, used a small notebook to shield her face from the larger-than-life images. His father, Lee, simply looked away. Several jurors were visibly shaken. A few cried. Others squirmed in their seats or covered their mouths. The fetus was discovered with a tape-like twine wrapped around its neck. Prosecutors claim the material attached to the body while it floated in San Francisco Bay. Defense lawyers have implied it may have been used to strangle the fetus after birth. The pathologist testified there was no indication the tape had been used in such a way. "I could see neither external nor internal damage that could have been caused by this material," he said. Dr. Peterson said the fetus' body was much better preserved than its mother's and still had all its limbs and organs. The remains showed no signs of severe damage from currents, tides action or feeding fish, he said. "If he had spent substantial unprotected time in the water like Laci did, he would have been eaten. There simply wouldn't have been anything left," Dr. Peterson said. "My conclusion ... is that Conner had likely been protected by the uterus" and expelled possibly weeks after Laci's body was put in the water, he added. Prosecutors are trying to prove that Scott Peterson killed his pregnant wife on or around Dec. 24, 2002, then dumped her weighted body into the bay. The remains of Laci Peterson and her fetus washed up along a bay shore in April 2003, not far from where Scott Peterson says he launched his boat that Christmas Eve morning for a solo fishing trip. The pathologist also said the fetus' umbilical cord had not been cut and there was no food in its stomach. The presence of food would have indicated a live birth. Prosecutors then worked to provide an explanation for why police have never found any of Laci's blood or any signs of a struggle. The pathologist speculated she may have died from strangulation or smothering, which could leave behind no forensic evidence, but it was impossible to be sure because her head and neck were missing, as well as her forearms, most of both legs, and all internal organs, except for the uterus. On cross-examination, defense lawyer Mark Geragos questioned the doctor's findings, implying that because the remains were so badly decomposed, nothing could be certain about the deaths. Peterson acknowledged there "might be other scenarios." Later, a forensic anthropologist testified that Laci's body had been in the water for three to six months.